The history of the Polish fertilizer industry can be traced back to the second half of the 19th century. In the period between the first and second World Wars, two nitrogen fertilizer plants (Moscice and Chorzów), four phosphorus fertilizer plants and three potassium salt mines were operating in the country. Some of these old plants, after considerable reconstruction, are still in operation but after the Second World War the fertilizer industry was practically rebuilt from scratch. In the second half of the 1980s it reached a peak production capacity of 1 640 thousand tonnes of N and 945 thousand tonnes of P2O5 annually. Potassium fertilizers, some 1 350 thousand tonnes of K2O, were imported from the former USSR and former East Germany. The fertilizer industry was a very important part of the central planned economy and its production capacity matched the demand for fertilizers by Polish agriculture. There were almost no fertilizer exports. Fertilizer production and distribution were subsidized by the State and the demand for low-cost products exceeded production substantially. Mineral fertilizers were much more easily available for the state farms, which were supported for political reasons, than to the individual ones. State farms, covering about 17 percent of the agricultural land, consumed more than 30 percent of the total fertilizers sold in the country. In 1991, the first year of transformation to a market oriented economy, the subsidy on fertilizers was removed and the demand from an impoverished agriculture dropped dramatically. The fertilizer factories reacted by reducing production and starting to export fertilizers. Few plants were closed. At present five large nitrogen plants and six phosphorus and compound fertilizer plants are operating in Poland (Table 9, Figure 6). The production capacity of these factories, particularly the phosphorus plants, is not yet fully realized and a substantial part of the production is exported to European countries and overseas. 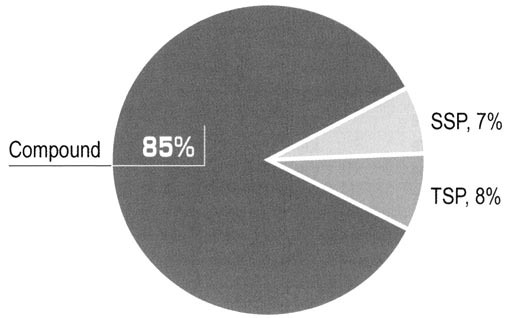 Source: Górecki and Biskupski, 1998. Domestic fertilizer consumption reached its lowest level in 1992 (1 135 thousand tonnes total NPK and 62 kg NPK/ha of agricultural land) and has been slowly recovering ever since. In 2001 consumption reached 1 615 thousand tonnes, of which 55 percent was accounted for by N, 20 percent by P2O5 and 25 percent by K2O. The share of nitrogen in the total NPK is much higher than before 1990 and nitrogen consumption is increasing at a faster rate compared with phosphorus and potassium. * Unfortunately the data concerning exports and imports are not fully available and reliable. The data concerning production and consumption in agriculture are reliable. ** There is no production of potassium in Poland. The consumption is that of imported material. The consumption of nutrients varies greatly between the different regions of Poland. The average figures for the years 1999 to 2001 are shown in Table 11. The consumption of mineral fertilizers in Poland increased by about 10 percent in 2001 compared with the figure for 1997-1999. It concerned all nutrients almost proportionally and therefore the N:P2O5:K2O ratio remained practically unchanged (1:0.35:0.44). The highest rates of mineral fertilizers, exceeding 110 kg NPK/ha, are applied in five regions in western and northern Poland (Kuj, Opl, Pom, Wlp, Zpm) (Figure 7). In the eastern and southern parts of the country, the consumption of mineral fertilizers is below 75 kg NPK/ha of agricultural land. These figures are to some extent misleading because of the different proportions of set-aside land, practically unfertilized, in the various regions of Poland. The products sold in Poland in 1998 are shown in Table 12 and the relative importance of the different products is shown in Figure 8 for nitrogen and Figure 9 for phosphorus. Until 1994 practically the whole amount of fertilizers was distributed in solid form. A new product, urea ammonium nitrate solution (UAN), launched by the Zaklady Azotowe, Pulawy S.A. plant, challenged the established distribution system for fertilizers. 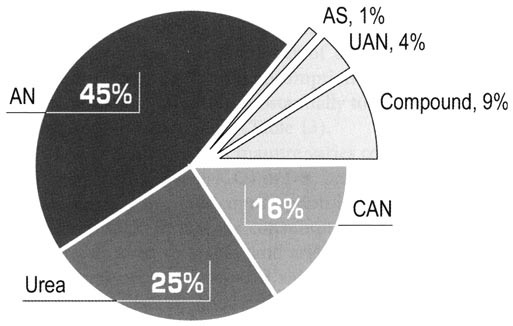 At the beginning of 1990s UAN was sold exclusively on foreign markets. The export of this product in 1993 and 1994 reached the level of about 600 000 tonnes. Since 1994, with the logistical and financial support of ZA Pulawy plant, a network of liquid fertilizer storage and distribution stations has been built, mainly in the Northern and Western regions of Poland. The storage stations are usually provided with two tanks each of 20 m3 capacity, located on a pad to secure against the accidental leakage of UAN. Due to the lower production and transport costs, the price per nitrogen unit in UAN is a few to several percent lower in comparison to solid nitrogen fertilizers. The consumption of UAN, starting from 25 000 tonnes in 1994, has been increasing steadily to the estimated amount of over 100 000 tonnes recently.